Ethel Merman …away from the stage	Maxine and Anita – new posts coming soon! 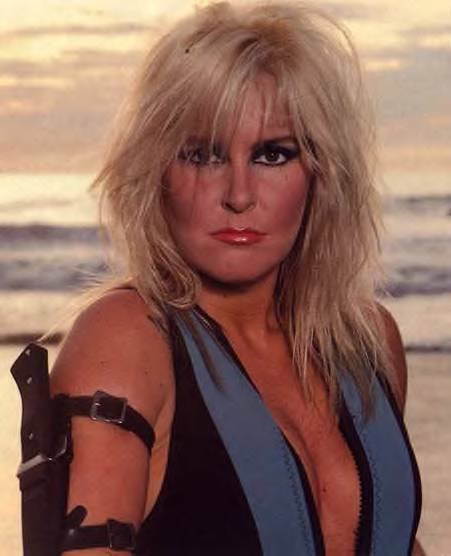 My appreciation and admiration for Lita Ford goes some 35 years back, to when I (aged about 12) discovered this amazing guitar player and singer for the first time. Since then, Lita Ford has been one of the very few female rockers to whom I’ve stayed completely dedicated. And it all has to do with her music! Lita Ford is a one of a kind singer, and her talent and diversity never ceases to amaze me. British born, Carmelita Rossanna Ford came into the world in Streatham, London in September 1958, her family relocating to the US when she was four years old. At age 11 she got her first guitar, thus creating an instant interest in playing that instrument. After a while she got some work as a guitar player for local bands. 1976 saw her being recruited by Kim Fowley to play in the first female rock group ever, The Runaways. Lita was one of the constant members, staying with the group from 1976 until they dissolved in 1979. Besides her skilled playing on all five official Runaways albums (4 studio, one live) she also contributed songs, like “Fantasies” on the “Waiting For The Night” album, and singing lead on “I’m a million” from their last album “And Now… The Runaways”. After the group she set her goals for a solo career, but for the first 4 years nothing much happened and she had a string of regular jobs; gas station attendant, perfume sales lady, hairdresser and fitness instructor. I’m sure the last three all suited her perfectly, as each and every record cover during her 30 years as a solo performer have made the most of her shapely figure and beautiful face. Out For Blood (1983) contains the stand-out tracks “Stay with me baby”, her version of “Any way that you want me”, the fast and furious title track and the ballad “Just a feeling”. A much rougher sound than anything recorded by the Runaways, this one kick started Lita’s solo career and made her the Queen of Heavy Rock of the 80s & 90s! Lita (1988) was her biggest album success, spawning hits like “Kiss me deadly”, “Back to the cave” and her Top 40 duet with Ozzy Osbourne, “Close my eyes forever”. However, there isn’t a bad song on this album – so if you never heard Lita Ford and looking for an album to start with, THIS is the one! Dangerous Curves (1991) contains four of the best songs Lita ever recorded: “Playing with fire”, “Shot of poison”, “What do you know about love” and “Larger than life”. On these four tracks, she fuses all her best qualities, playing and singing into four different rock masterpieces! Nothing wrong with the rest of the record, but the songs pale in comparison to these four! In Concert (2000) is a collection of live tracks that has been repackaged and released on several different budget labels. I still think you should get it, as it shows our heroine doing her thing on stage. And it does contain one new studio track “Nobody’s Child” which is very good, and sounds like it could have been recorded around the same time as her 1991 album. It’s a powerful pop-metal track with good lyrics and Lita is in marvellous voice on this one! Wicked Wonderland (2009) after a 14 year hiatus out of the studio, she came back with this, a very heavy record showing that at age 50 she still has the talent for creating fabulous rock music, her voice and talent intact and also very much keeping up with current trends. A little hard to access at first playing, believe me – this one will grow on you with each repeated listen! Living Like A Runaway (2012) is her latest album, and what a stunner!! Stylistically more along the lines of the albums she made 1988-91, this is Lita at her best! There’s not a bad track on the album, but the one song that really stands out is the title track, “Living like a runaway”. A very personal lyric is combined with maybe the most commerical music she has ever recorded, this song just about tops anything she has ever done on record. It’s the kind of song that should land her another Grammy nomination, as well as high chart placings! It also proves, that while she was always a great singer, her voice has now taken on yet another dimension and she sings about her own life with great conviction and a real “joie de vivre”. There’s just one thing to say about this album: “Every home should have one“!